Check out these Sacred Heart Cookies made by Sharon. Sacred Heart & Immaculate Heart sun catcher crafts! Sacred and Immaculate Heart crafts. Oh, I love the cookies! And thank you for reminding us that we have the whole month of June for celebrating the Sacred Heart of Jesus. I was starting to get a little anxious there, seeing as how the Feast is tomorrow! wonderful. what would we all do without you helping us come up with craft ideas! we just finished our HUGE sacred heart. THanks for all the cool ideas!!! 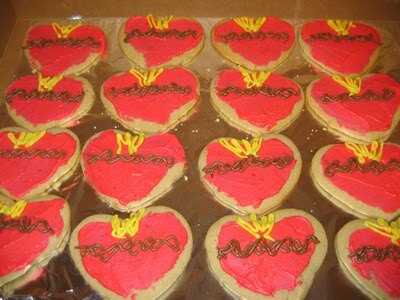 LOVe love, those cookies!! !